Here is your chance to have actual dialog you wrote appear in Thimbleweed Park. " Wow!" you're saying, "Does this mean I get to write the climatic scene with the killer?" Not exactly. "OK, then the pivotal interrogation scene where Detective Ray finally breaks him down?" No, not that either. "Oh, so I get to write a scene with the Quickie Pal clerk where he spills an important clue about the case?" Nope "Well what do I get to write!" you respond with equal parts confusion and frustration. You get to help write the Drinking Fountain dialog. 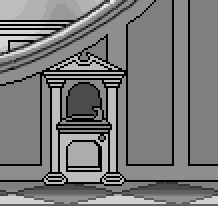 But that would be boring and since I was in the middle of implementing the new dialog system, I though this would be a great opportunity to do a fun dialog with the drinking fountain. Not actually a dialog WITH the drinking fountain, but some fun dialog choices while you were drinking. It's a fun little dialog to play with, but it could use a lot more funny slurping noise lines, so this is where you come in. If you have any suggestions for lines, put them in the comments and the best ones will go in the game. The dialog could be even better if the choices branched off to other nodes and there was some escalation or even mini-story told through slurping. Feel free to go nuts. If it's funny, I'll add it to the game. The only thing I ask is there aren't actual spoken lines, it's all slurping (or other bodily function) noises. The format for the dialogs is pretty simple. There can be only one 1 and one 2, etc choice, so the first one chosen is used and the others discarded. the [random] condition makes the odds of it bing chosen random. the -> label just tells the system where you go if the choice was selected by the player. You can refer back to this post for more examples. I love playing with stuff like this. It's completely meaningless to the game, but they are quick and fun to implement and play. I've always felt odd detours is what gives a game it's real charm. It's also why I like making adventure games in an almost improv fashion. When I see ideas like this in a game, I know the team had a great time making the game. It's also why I like creating using file formats like these .yack files. The drinking fountain puzzle might be really funny, but it also needs to be fast to implement. If you're writing a bunch of code and involving three other departments to make it happen, not a lot of ideas like this will go in the game. The time from idea to implementation should be measured in minutes. Drinking fountain dialog puzzles also don't make it into design documents and if it did, they'd likely be questioned and challenged by the publisher/producer: "Do we really need the drinking found dialog?" It's a hard one to defend, but yes, we do need it. When you're adding quick little gags like this, you never know which ones will work or not, so you add as much as you can. Done well, it's the kind of stuff you remember twenty years later. slurp sip lap *help i am trapped under the water fountain* slurrrrrp...What was that? Actually, just make the character go "blublublublublublublublublub"
Perhaps not quite funny (though somebody wittier than me could make it so) -- but you never seem to see somebody screw up drinking water in games by sucking it down their lungs instead. Or the other great one is gargling while drinking. What about splashing water instead of drinking it? "Sprutrtrtprtpt"
"Gee... is this really water?" "I hope the tap was disinfected"
"The water is bit brown, but if it doesn't kill me I guess it's fine." "I hope there's a grog fountain somewhere"
1. Slurp slurp slurp... ewwww, yuck... gulp gulp gulp guzzle guzzle. 1 slurp slurp hmmm.. slurp..
2 gulp gulp.. I’m thirsty..
10 TAKE ON THE WORLD!! "hmmmmm, tastes like water from the holy grail"
It's dialog like this that gives the true Maniac Mansion feeling. Like the sound Luke's running Tauntaun makes in Empire. gulp gulp look gulp mommy! SLURP? Aschlup glug! Slurp-slurp swish slurp... ...gluglug, Mêlée Island™! ...a-glug gulp: ...LeChuck! Gurgle! Hey! That would be nice! 2 slurrrp - wait, did my lips just touch the fountain? 3 sip - some people call this a bubbler. 6 Let's see if I can keep any water from going down the drain. SLUUUURRRRP. 7 Oh no, a succubus has appeared! I must start taking off my clothes. 8 Perhaps I should kick this water fountain? 9 I've had so much that the water is turning warm. I'll have to wait for the compressor to kick in if I want it cold again. 10 I need to spit, but I don't want anyone to see. I'll just casually pretend to take a drink, and let this load of spittle wash out of my mouth. 11 Great. If I wanted a sinus rinse, I would have asked for one. "Wait... something solid was in the water... SOMETHING WENT IN MY MOUTH. OH GOD"
2 Is that still water or even incontinence ? 4 If it flooded everything , I'm Moses and share the water …. 9 Ohhh ... a dog toilet … I don’t think that I can drink this…. 10 The North Atlantic !! Hurrah! 11 American beer is a successful attempt to dilute water . 15 Water, water, every where, And all the boards did shrink; Water, water, every where, Nor any drop to drink. 16 What did the sink say to the water faucet?You're a real drip. 17 Did you hear the watermelon joke? It's pitful. 18 My girlfriend is so ugly, when she gets in the tub, the water jumps out…. 19 Is it dangerous to swim on a full stomach? Yes. It's better to swim in water. 21 Spoiler: When I drink this -> GAME OVER. 24 In Monkey Island they call it Grog. 26 Here comes the flood! 27 Have you ever the the rain! 29 Sitting on the dock of the bay! 30 Is that the Victorian style ? 32 Cool. A pile of blue pixels ! 33 This is a product of Catholicism … Where is the crucifix ? 35 Time for the six o’clock tea , James ! 39 Behind you! A three headed Monkey! 40 By the way... I'm selling this fine leather jackets! 41 There's a fish in the water: maybe I should talk to him... hello Putt Putt! Where's Freddy Fish? 42 Oh! Freddy Fish! Are you're friends drinking at the Scumm Bar? 44 (after drinking and falling asleep - a song in a short dream sequence) "The rib bone is connected to the arm bone. The arm bone is connected to the head bone. The head bone is connected to the leg bone." 45 I should drink the water... Don't Be A Tuna Head! 5 ngk, ngk, ngk, ngk …. 6 aaaaahhhh… glug, glug, glug, glug … aaaaahhhh…. 8 frrrt, frrrt, frrt … hfff…. 14 gluck, gluck, gluck, gluck …. "The air in this town is making my nose feel really dry. Hm.... SNORT SNORT SNORT SNORT"
...Sip.. sip sip siiiiiip! SIIIIIIIIIIIIIP! Slrp slrp gobble gobble slosh k-*brrraaAAAH*!! Swab *belch* swab *belch* dribbledrizzle glub. Dibble dibble dopp burble frssssssshh! 4 sip sip sip sip sip slosh SPLAASHH! Agent Ray: Now I'll wash my armpits. 1 Slurp!!.. sip sip sip sip Ahaaa! 2 gulp gulp SLURP! gulp gulp SLURP! 3 Gulp!.. Gulp Slurp Gulp!... Gulp Slurp Gulp!... Gulp Slurp aaaahh…. A careful mapping between slurp type and note pitch/length should be done. This would be a great audition piece for voice actors. May the great Iwata-san rest in peace. This is my little "sip-a-dip" dialog puzzle sketch. Unfortunately it would work much better with a special diving animation (see my comments below in this regard). sip-a-dip //The upper part of the body immerges into the basin. Let's keep this in private, okay? If you took any screenshot, delete it immediately, please! I definitely survived that act just because this is a stupid computer game! You have no idea, tuna head! Oops, broke some rules, and didn't format properly.. Harder than it looks! Sip sip shlump slush splash, gargle RANSOME™ gurgle, gulp, hics! Good chance for the translation ! Ahhh - nothing beats a sip from the bidet. 2 Sip. Ever wondered where this water has been before? 3 Gulp. It could have been part of a dog's testic... "BURP" disgusting. // I hope I got the syntax right. E.g. the animal option should only become available after drinking a few times. // Ransome, whereas Dolores might be the only one to have a small bladder. // I also assume that every dialog line you select is actually displayed before given the next dialog options. // I have no idea why I am putting these comments as code comments. Just in case you copy the whole thing ad verbatim. You can tell is if it's playable character using the [ray] or [delores] or [ransome] conditionals. -> labels can only appear after choices or on a line by themselves. "It looks suspiciously like an urinal"
- how many characters are expected to be drinking from that fountain? - - if more than one are they all going to follow the same script or will it be a different dialogue script for each? - the dialogue scripts, do they have to be static or can they be automatically generated based on some other element(s) of the game? Has water always tasted this... mineral-y? Ransome should better not make use of the drinking fountain because of his make-up. Otherwise he mutates into the joker or something like that. "Mirror Mirror on the Fountain ... who is the smartest clever handosome water slurping FBI agent ?. I bet you is me!!! ." Slurp... zsalu? szplug??? plug!, szcht! szplitz! *Reads like:* Slurp, surprised gibberish, Plug??? PLUG!, <certain swear word>, Spits! 4. I can bottle this liquid and sell it for crazy high prices! I will be rich! 6. Drinking water will not help to solve the case faster, you know? 8. Wish i get paid to drink water all day. Oh wait... i am! No im not, lets get back to it, shall we? 9. Boom! There goes my bladder. 12. Well well well, what do we have here? Oh, its just water. Sorry if i made gramatical errors Ron, im from Argentina. Fell free to change any of it though. "Tastes weird. Like radioactive water from a swimming pool." Ron, does Boris already get working drafts of written dialog or does the translation happen in bulk at the end of the project? It' happens in bulk at the end of the project. Too much changes during the project and they would be too hard to track and a lot of work would end up being redone. Thats what i guessed. I just thought about an interview with Boris i have read a very long time ago where he said (dont know if i remember it correctly) that he got floppys with sourcecode in which he coded the translation directly. And every now and then the content changed and he had to track it down and a lot of work ended up being redone. I wonder if Boris is following this blog, too. Ron, it would be nice if you could warn us when you spoil a joke. That's why I would prefer some traditional folk songs that have to do with water such as "My Bonnie Lies over the Ocean" or some sea shanty. 1 - Fluourp, fluourp, fluourp... refreshing ! With all this fluoride, I am certainly less smart now. There is no puzzle. It's just for fun. Maybe different "drinking stories" for different players. The short "morse code puzzle" above for geeky delores and animal story alternative if you play ransome? "Tastes like lead with a hint of lemon. Yuck." "♪ ♪ ♪♪ ♪ ♪♪ ♪ ♪♪!" There it goes: yet another attempt to reach glory and fame going after my ancestors trail I bestow upon you, oh Thimbleweeders, a bit of my unfathomable knowledge. # Play credits.....or abort.....or autodestroy game......whatever!!!!! Gulp gulp gulp... all work... gulp gulp... and no play makes... BURP... a dull boy! Or something from the swordmaster Fighters. "Dammit, now I have to pee!" "Someone should think of bottling this stuff!" That's the second biggest bidet I've ever seen! This urinal is high up. Damn high! I think this is a very funny idea! Looking forward to a voice actor doing ALL of these! Or just doing every noise once, and then having this played back by a sequencer XD. 1. Yuck!!! Tastes like the river behind Doctor Fred's house. 2. No, I don't want to drink more of this stuff or I'll sprout another set of arms. 3. EH EH EH EH HHHH I WANNA TAKE OVER THE WORLD... Just kidding, relax. Sorry that this isn't what was asked for, just an observation. That's said, there have been some really good ideas here. I'm going to steal a lot! 1. Glug, glug. It tastes AWFUL! 2. It's going to overflow! 3. Hmm. 1939. A very bad year. 4. Water, water everywhere, and every drop to drink! 5. Somebody's poisoned the waterhole! 6. Who'll stop the rain? 7. Why am I only happy when it rains? 8. Just a box of rain. 9. It's hard to hold a candle in the cold November rain. 10. But I love that dirty water, oh, Thimbleweed, you're my home! 12. Let's make the water turn black! 13. Water? I HATE water! 3. Water in the hole! 10. I don't drink water. Fish mate in it. I talked about that in a previous post. Once everything is written, the text is extracted and tagged with NUMBERS, those are then used to look the text up in translation tables and for talkies. Thank you Ron! Actually, I was thinking less technical but more about how the translators would handle language - specific jokes / sounds and how the voice acting will perform dialogues like "gulp gulp slurp gulp"... I am looking forward to it! 3. Glug glug Glug, Blub blub Blub! Optionally there could be like a Sierra death screen after Cthulhu has been summoned and therefore the world is doomed now in death & despair. But that requires some extra work of course. Thought It might be a fun reference to the Sierra cliff scene in Monkey Island. Or maybe a bit too forced after all. Maybe the words in part7 should print out in several "gulps"in succession and not just splash the whole line in one. 1. A weissbeer fraulein! Stop! When I learned German? 3. This fountain contains 30% bacteria, 30% germs, 30% viruses and 31% drinkable water. Should be safe, if I don't miscalculate. 5. A fountain? I need a RESTROOM! 6. Must be one of the fountains of paradise. 8. Did you know? I'm able to drink water 10 minutes long. And I'm not drowning! grog grog grog grog grog... uuhmmmm... glugg glugg glugg glugg glugg. GROG. Are drinking fountains are shorter than they used to be? Mountain fresh.... With a hint of Oricalcum..
Ahhhhhh ... 100% pure slurply odorless drinkable H2O(TM) ! I did this before I read you didn't want dialogue with the slurping but I'm going to add it anyway, cheers for reading. Aaah, refreshing H20, nectar of the gods. Hmm, nectar of the gods…what does that even mean? Does it mean they freshly squeeze gods for juice? Am I drinking essence of Thor right now? Hmm, it kinda tastes funny, maybe it's Loki. Almost as good as the Thirst Quencher 3000. I think there is a secret code in the water....nope, just cholera bacteri. What was that about the memory loss water experiments? Hey, a water fountain! "Man, I haven't felt like this since Woodstock!" "Yuck! Never go for tap!" That sip was for you, California. No, really, I'm very hydrated at this point. Please, stop. There are no usable bathrooms in this game and you're not even half way done yet. If you click on the drinking fountain one more time this game will automatically delete itself from your computer. Thank you for purchasing Thimbleweed Park, a cutting edge water drinking simulator. You know what might help me solve the case? Drinking from this water fountain 87 more times. Such an inspiring post. Back when I played your older graphic adventures, it was clear for me that this must be the way games are made, even though I didn't know how they got made. But I could feel it from just playing your games. However, as I grew up and learned more about game development and played a larger variety of games, I noticed that a lot of games are developed like any other piece of software, where every detail is designed by committee and small ideas like this get cut because there is no rational way to justify them. But, like you said in your post, "yes, we do need it." It is part of the soul of a game, and having the ability to just throw a random idea in without much of a time cost can make the difference between a bland game and a memorable experience. I am very glad that you're among the few still making them this way. Don't suppose there's any chance of working a curly straw into it and it making that wonderful buzzing noise (from Monkey 2 regarding the spitting contest etc)? A touch elaborate I suppose... Cracking work though and if ever stuck for inspiration, my advice would be to read any P.G. Wodehouse novel, again... Great work, keep it up! NOOOO! Do not let Tim anywhere near this game! He's way to busy driving the Tim Schafer hype-train. I have a feeling Ron left Double Fine for a reason and he's being polite and just not saying anything. Do Tim and Ron even speak anymore? Did Tim support this Kickstarter? He did one tweet and then ignored it. gulp, gulp, gulp, gulp... burp! Better still, "shoop shoop shoop shoop"
"Shoop shoop shoop shoop, yeah"
Wah - this water tastes heavy. Hope there's no reactor in the basement!